Earlier this week, RocCity Coalition invited young professionals to our final Network/Learn event of the 2015-16 year: a tour through the new Digital Digs at the Democrat & Chronicle. Just like our past events, this was another fantastic behind the scenes opportunity for our members to see and learn more about new and iconic area in Rochester, NY. The Democrat & Chronicle’s shiny new offices are located at 245 East Main Street – directly across from the famous Sibley Building, which is also going through a slew of renovations. This is a part of the revitalization of the downtown Main Street area that we’re excited to see develop over the next few years. Our tour, expertly guided by Julie Philipp, D&C’s Senior Engagement Editor, started at the heart of the operation in the open-plan newsroom. There we met with Executive Editor and VP/News, Karen Magnuson, who talked about the transition to digital and how that is tracked across multiple facets within the newsroom. Our group also had the chance to meet and ask questions with the head of the D&C’s watchdog team Matthew Leonard, columnist David Andreatta, and investigative reporter Patti Singer, along with several other editors and reporters. 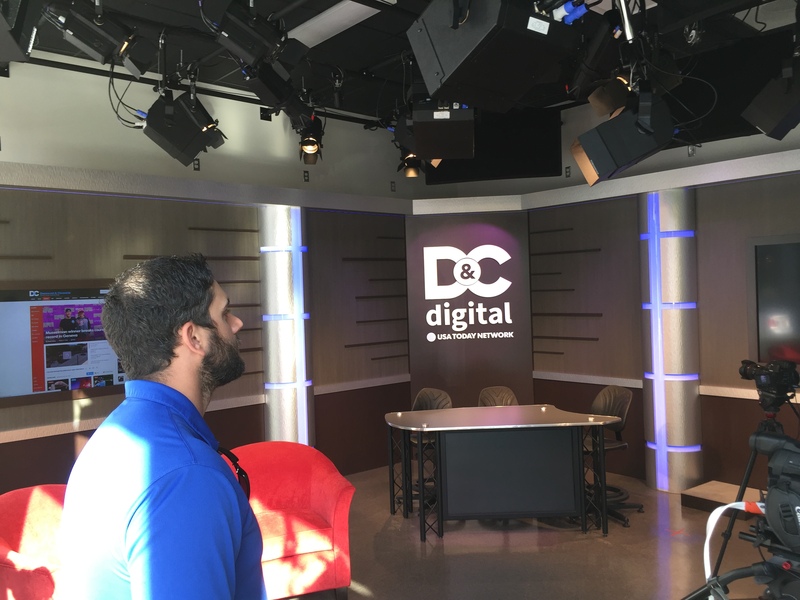 We continued to the first floor to get a glance into the new D&C Digital Studio, which is fully equipped for video production and live webcast. Studio director Ginny Butler pointed out that the set was designed and constructed by UNISET, a company based right here in Rochester, NY. We were asked to picture the space with onlookers peering in from East Main Street, just like NBC’s Today show studios in New York City (make sure you wave when you walk by a live set)! Our next stop was the D&C Innovation Lab, where a half-dozen people are focused on developing new digital products such as apps for all Gannett properties. It is one of only two for the company in the entire country – and it’s right here in Rochester! Lastly, we gathered as a group to learn more about the D&C’s up and coming Young Professional Advisory Board. Members will meet monthly among the news team to discuss current trends and issues impacting our community – stay tuned for more details or contact Julie Philipp for your interest here. To learn more about RocCity Coalition, visit http://roccitycoalition.org and sign up for our newsletter. We have some great things coming up between now and end of 2016 – and you may want to be the first to know. Fast Fact – Did You Know? Did you know the D&C was actually located on the Main Street Bridge before moving to Exchange and now back to Main Street? Check this out! © 2016 RocCity Coalition. All Rights Reserved. Designed and developed by Mason Digital.